Quilt Two is now completed! This one I made for my grandmother, and was inspired in part by Hawaiian Quilts. Final size is approximately 50×50 inches, which is not really a standard size for anything, but just what I thought looked good and would work as a smaller lap quilt. I did a much better job of the binding this time around, in fact there were corners I felt looked downright professional! I am going to mail this out just as soon as I figure out my letter I want to write with it. I’m sure that societal conventions would say this is a Christmas Gift type of quilt, but I’m too impatient to tell her I love her and think about her all the time. So conventions be damned! 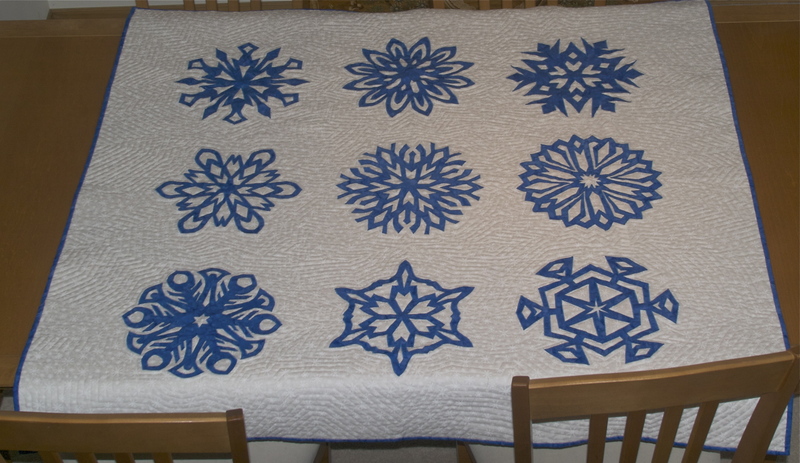 There is a whole gallery about this quilt you can check out with pictures of flakes I didn’t use, close ups of materials and in progress work available here. I plan to send some of those photos with the quilt. While putting this together I found some pretty cool stuff… like there was a fine Gentleman by the name of Wilson A Bentley that took the first photo of an individual snowflake all the way back in 1885! And he was so fascinated by snow, he went on to take 4999 more! You can read a bit more about him over at snowflakebentley.com. Also… there are scientists at Caltech creating snowflakes in their lab to study how they are formed, and you can watch video clips of some of the snowflakes being formed on their site SnowCrystals.com.